Leamington’s three-match winning run was brought to an end at home to fellow form side King’s Lynn on Saturday, writes Paul Okey. The draw maintained Brakes’ three-point gap to the final play-off place but after dominating the first half only to find themselves a goal down at the break, it could have been so much better for Paul Holleran’s side. 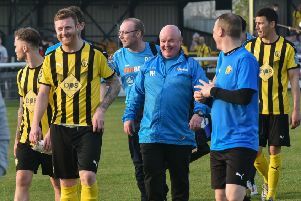 Jamie Hood returned to the starting line-up at the expense of Jamie Tank after recovering from illness, with the match kicking off 20 minutes late due to a road traffic accident directly outside the ground which delayed supporters getting in. As it was, any late arrivals still had plenty of time to grab a drink, a bite to eat and flick through the programme before the action started, with nothing of note taking place until just short of the quarter-hour mark. Lee Moore beat his man and put in a dangerous cross which was hastily cleared behind by a retreating Sam Gaughran and then Rob Ogleby wasted a free header in the box, directing it tamely at keeper Alex Street when he had time to bring the ball down. Courtney Baker-Richardson’s centre just needed a touch as it fizzed across the face of goal, while Richard Taundry’s free-kick forced Kern Miller into an awkward clearing header. Sam Austin struck a sweet volley straight at Street but any head of steam the home side were building quickly evaporated as Ogleby pulled up in the 22nd minute chasing Taundry’s ball forward. The striker limped off to be replaced by Ben Mackey and the substitute had been on the field just over a minute when the visitors opened the scoring with their first shot of the game. Michael Clunan delivered a free-kick from the half-way line and King’s Lynn won two headers inside the box before Gaughran swung wildly at the loose ball to divert it home via the crossbar. The home side’s response was a while in coming, with Taundry’s superb crossfield pass picking out Mackey in the 38th minute. The striker’s first touch took him slightly wider than he would have liked and his left-foot shot across Street lacked the power to beat the keeper who claimed at full stretch. Indecision from Hood almost presented Linnets with a second, but Ryan Fryatt flashed his shot over. Mackey’s desperation to score a goal showed itself when he took on a wildly ambitious volley from wide on the left, but he was much closer with his next effort, which was deflected for a corner. In keeping with a frustrating opening period for the home side, Moore fire the resultant dead ball straight out of play. Edwards had two chances in the space of a 60 seconds seven minutes into the second period, seeing a header tipped over the bar by Street and then meeting Moore’s corner at pace, only to direct his header wide. Clunan’s free-kick whistled across the face of the Leamington goal before Lee Smith’s first-time effort went straight at Breeden following neat build-up play on the right flank. Leamington were deservedly level on the hour-mark but there was a hint of controversy surrounding the equaliser. Baker-Richardson’s flick forward dropped into space on the edge of the King’s Lynn box and Edwards showed the greater desire to nip in and touch the ball on, taking down defender Jordan Yong in the process. The loose ball was then scuffed home at the near post by Mackey, with the off-balance Street having already committed himself. The visiting players went as one to protest to the assistant referee, claiming a foul in the build-up, but the officials were unmoved and the goal stood. A fired-up King’s Lynn responded with Smith heading wide from a corner and then pouncing on a Tony Breeden throw-out and advancing on goal before dragging his shot well wide of the target. Lee Stevenson then connected sweetly with a long-range effort which failed to trouble Breeden. Another Edwards header was hacked away from the line by Gaughran, while at the other end Toby Hilliard flashed an effort over after Clunan’s free-kick had evaded the first man. A positive run from Austin ended with a wayward finish from Baker-Richardson but the Burton loanee was much closer with the hosts’ next attempt, linking up cleverly with Moore on the right before sliding his shot agonisingly wide of the far post. Sam Mulready’s measured header from Smith’s acrobatic cross landed on the roof of the Leamington net and the final chance of a positive conclusion came and went when Mackey slipped in Baker-Richardson whose shot on the angle was straight at Street. Brakes: Tony Breeden, Richard Taundry, Connor Gudger, Joe Magunda, Jamie Hood, James Mace, Lee Moore (James Fry, 84), Jack Edwards, Rob Ogleby (Ben Mackey, 24), Courtney Baker-Richardson (Ross Oulton, 89), Sam Austin. Subs not used:Jamie Tank, Ben George. Kings Lynn Town: Alex Street, Ryan Fryatt, Jordan Yong, Kern Miller, Matt Castellan, Lee Smith, Michael Clunan (David Bridges 80), Liam Hurst (Toby Hilliard, 67), Jacek Zielonka (Sam Mulready, 71), Lee Stevenson, Sam Gaughran. Subs not used: Jack Friend, Dylan Edge.